The Green Bay Packers, defending champions of the NFL, were under a new head coach as they faced the College All-Stars on August 2, 1968 for the benefit of Chicago charities. Vince Lombardi, having led the club to five league titles, including the last three in a row (and wins in the first two Super Bowls), handed over the reins to defensive assistant Phil Bengtson, although he remained Green Bay’s general manager and was watching from the press box. After having been upset by an All-Star squad in 1963, the Packers had thrashed the collegians by a combined score of 65-0 in 1966 and ’67. 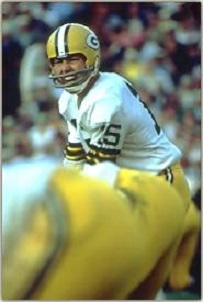 Green Bay still had an effective, if aging, veteran core, with the offense directed by QB Bart Starr (pictured above) behind a solid line and the defense containing stalwarts such as DE Willie Davis, DT Henry Jordan, MLB Ray Nitschke, CB Herb Adderley, and FS Willie Wood. If there was a major question at this early stage, it was who would handle the placekicking following the retirement of Don Chandler. Norm Van Brocklin, former star quarterback in the NFL and first head coach of the Minnesota Vikings, coached the College All-Stars. The roster contained the usual assortment of future pro stars that included C Bob Johnson from Tennessee, USC tackle Ron Yary, TE Charlie Sanders of Minnesota, and running backs Larry Csonka from Syracuse and MacArthur Lane of Utah State on offense, while the defense had Tennessee State DE Claude Humphrey, DT Curly Culp of Arizona State, and Texas-El Paso LB Fred Carr. There were 69,917 fans in attendance for the Friday night game at Soldier Field. 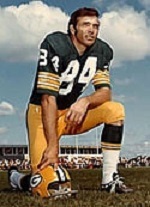 Getting the ball for their second series of the game, the Packers were pinned deep at their three yard line after a 55-yard punt by Jerry DePoyster of Wyoming. However, Bart Starr faked a handoff and then threw to HB Elijah Pitts down the middle. Pitts broke away for a 72-yard gain to the All-Star 26, finally being hauled down by Fred Carr (Green Bay’s first-round draft pick). Six plays later, HB Donny Anderson scored the first touchdown of the game from a yard out and Jerry Kramer kicked the extra point. Twenty seconds into the second quarter, Starr threw to flanker Carroll Dale (pictured at left) for a 20-yard TD to conclude a 12-play, 89-yard drive. Kramer again added the point after. 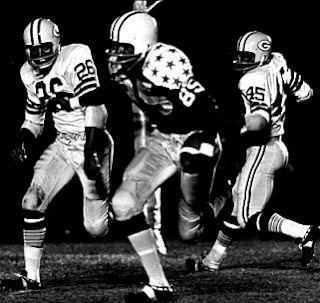 Later in the period, the Packers went 73 yards in four plays, with Starr connecting with Dale for another touchdown, this time covering 36 yards. Kramer’s third PAT made it a 21-0 score. The All-Stars, who relied heavily on the running of Syracuse FB Larry Csonka in the first half, responded by driving to a 22-yard field goal by DePoyster. It wasn’t much, but it was the first time a group of All-Stars had put points on the board in three years. Green Bay scored once more at the end of the half as newly-acquired PK Wade Traynham kicked a 30-yard field goal. In the third quarter, the All-Stars got a break when Green Bay FB Jim Grabowski fumbled the ball away at his own 37. After Csonka pounded away for a total of 30 yards, QB Gary Beban, a scrambler out of UCLA, threw a fourth down pass to WR Earl McCullouch from USC for a seven-yard touchdown. DePoyster kicked the extra point and Green Bay’s lead was narrowed to 24-10. The Packers came back with another score, however, with Starr once again connecting with Dale on the first play of the fourth quarter for a 13-yard TD. Kramer converted. Later Kramer, who missed on a 45-yard field goal attempt, was good from 47 yards out, setting a new record for the All-Star Game and giving Green Bay a commanding lead. Down 34-10, the All-Stars fought back, advancing 76 yards with Massachusetts QB Greg Landry throwing to McCullouch (pictured below) for a 24-yard touchdown. DePoyster kicked the point after, and while it brought cheers from the crowd, it proved to be the game’s last score. The Packers won handily by a final tally of 34-17. The Packers led in total yards (381 to 312), although the All-Stars outgained Green Bay on the ground by 206 yards to 88. The pro champs also had the edge in first downs (20 to 17). The All-Stars turned the ball over four times, to one suffered by Green Bay. Bart Starr completed 17 of 23 passes, including ten in a row at one point, for 288 yards and three touchdowns with none intercepted. Carroll Dale had 6 catches for 103 yards and three touchdowns. Donny Anderson led the Packers with 64 rushing yards on 11 attempts, one of which was good for a TD. Greg Landry was successful on 7 of 14 throws for 79 yards and a TD with one picked off and Gary Beban went three of six for 27 yards and a touchdown but also gave up two interceptions. Larry Csonka rushed for 95 yards on 18 carries. Green Bay’s win put the pro champs ahead in the series by 24 to 9 with two ties. It was the sixth win in eight appearances for the Packers, and would turn out to be their last. High expectations for the team to remain at the top were dashed as the Packers slipped to 6-7-1 with age and injuries, including one to Starr’s arm, ultimately taking a toll. Larry Csonka joined the Miami Dolphins of the AFL and, after a slow start, went on to rush for 8081 yards in the AFL and NFL, gain selection to five Pro Bowls, and ultimately earn enshrinement into the Pro Football Hall of Fame. Earl McCullouch had the more immediate pro success with the Detroit Lions, earning consensus Rookie of the Year honors after catching 40 passes for 680 yards and five touchdowns (two of which came against the Packer). His career took a downward course thereafter and he ended up with just 124 pass receptions in seven NFL seasons.